Tata Harrier Detailed Walkaround Video: Worth the hype? The Tata Harrier is a direct descendant of the stunning Concept H5X we saw at the 2018 Auto Expo. Is the production-spec SUV watered down a bit too much compared to the concept? Not entirely. It does stand out in a crowd, especially finished in bright orange. The headlamps have been moved down to the bumper, whereas the daytime running lamps take t heir usual spot. Much like the concept, the Harrier too features connected tail lamps. An underwhelming aspect are the 17-inch wheels. We think it looks too sober compared to the rest of the car that commands attention. Step inside the cabin of the Harrier and you’re greeted by the best interior Tata has dished out till date. The quality of materials, the minimalistic design and the generous peppering of features has us excited. On offer is leather upholstery, an 8.8-inch touchscreen and a 7-inch display in the instrument cluster. You also get the usual premium car bits, including automatic climate control, rear AC vents, as well as cruise control. There are weird omissions, though - that of an auto-dimming mirror, a powered driver seat and most importantly, a sunroof! That said, it’s a spacious car for five occupants, and the 410-litre boot will be more than happy to take the luggage too. 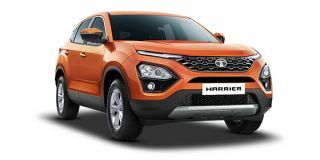 The top-spec Harrier XZ features six airbags, ABS with EBD, electronic stability control as well as hill descent control. You’re more than covered on the safety front. Weirdly enough, ISOFIX child seat mounts are limited to the XZ variant, which we think should’ve been standard across the range.